Championship season is really opening up now and Monmouth County unleashed the fury on Friday. With 26 performances making the MileSplit National Elite Standards there could have been even more! The boys high jump wasn't contested and Mark Anselmi, the state leader and US#5 high jumper this season, was set to compete fresh off his big 6-08 PR last week during Monmouth Relays. 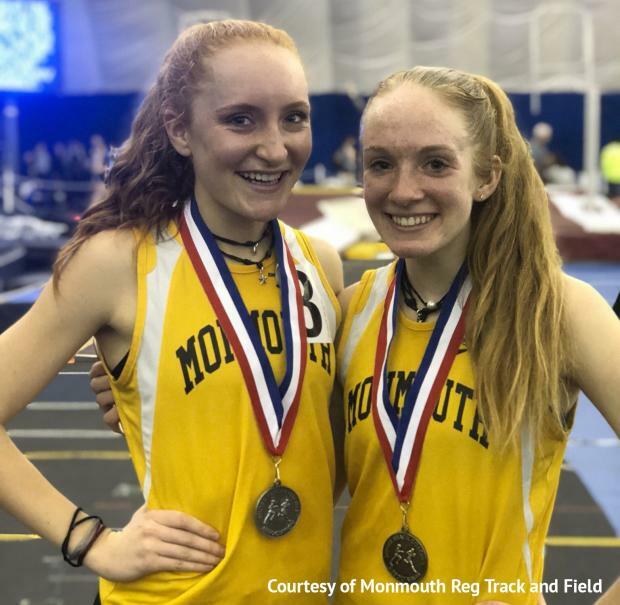 A major highlight of the night came during the girls 3200 meter run when Amanda Stone of Monmouth Reg won her first County title running 10:52.45. That moved her up to US#3 on the converted two mile list, broke Monmouth's school record, and annihilated her own previous indoor PR of 11:14.35. Her teammate Samantha Ragenklint was behind her in second running 11:31.64, both girls are juniors. Emma Vasen of Ocean Twp tied her school's indoor shot put record with her throw of 42-10 improver her NJ#2 listing. Red Bank Reg's Tiaunna Macon is now NJ#3 with her 40-06.5 mark for second place. Back to the girls distance Madison Brand of Middletown South won the 1600 meter run with a time of 5:06.09 NJ#3, she now has a Monmouth County title from all three distance running seasons. Manalapan's William Spector ran 9:36.81 for gold, the fastest 3200 meter at the Bubble this season and NJ#3 with converted two miles. His teammate Christopher Maiurro won the 55 meter dash running 6.57, that's a major PR for him and moves him up to NJ#6 this winter. Zachery Hall of Matawan had already posted a faster 400 meter time this season, with his 50.81 NJ#7 during the Ocean Breeze Holiday Festival, but his 50.95 Friday night was on a non-banked slower track and still almost set a new PR for the junior. 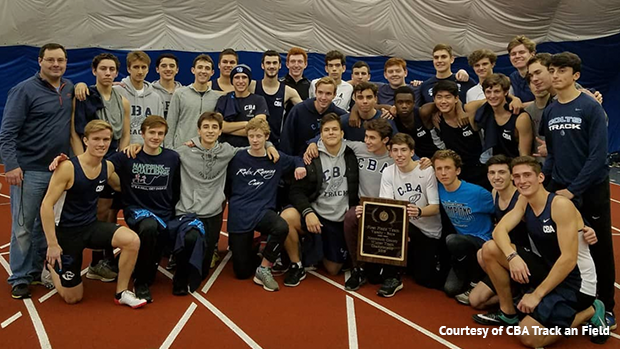 A remarkable nine straight indoor Monmouth County titles now for CBA. They won with 61 points to Matawan's second place total of 45. Dan Mead was one of their top performances striking gold in the shot put with his 57-08 mark. That moves him up to NJ#3 and breaks the top 15 nationally. Tim McInerney won the 800 meter with a time of 1:57.11 NJ#4, his best indoors. Their third gold medal performance came from the last event of the day with the 4x400 meter squad running 3:29.85 NJ#7. The rest of their point total came from a balanced set of events: Andrew Canale second in the 400m, 51.67, Troy Hill second in the 3200m, 9:38.45 NJ#7, Ryan Bragg third in the pole vault clearing 11-06 to name a few. CBA's full stat report and breakdown can be found here. 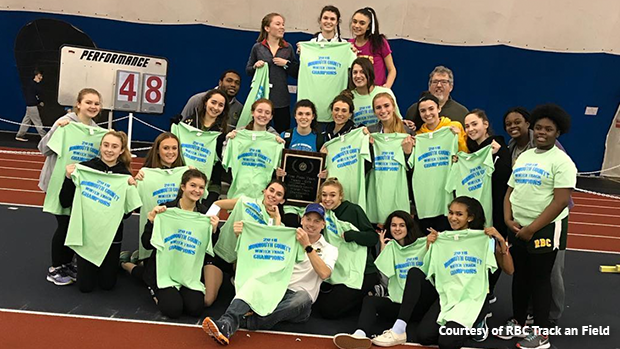 Red Bank Catholic won their third straight Monmouth County title and fifth overall. They did so with 48 total points, 18 ahead of Howell in second place. 14 of those points came from one event, Jessie Castellano won the 400 meter dash running 1:00.44 and her teammate Jackie Rieger was fourth at 1:01.90. They were both listed on the winning 4x400 meter which ran 4:11.13 for gold. Trying to top that a second set of 14 point came from ONE individual, Tara Zeni cleared 9-06 in the pole vault to place second overall and was third in the 55 meter dash finals running 7.58. Caitlin O'Hare placed fourth and sixth in the 1600 and 3200 meter respectively and Julianne Kopec placed third running 2:24.52 in the 800 meter. For RBC's full stat report click through here. Event links lead to state rankings.